Previously relocated residents of southeastern Bangladesh are returning to the sites of their former homes in hilly areas at high risk of landslides, say activists and locals. Illegal hill-cutting in order to site houses has left tens of thousands of people in Chittagong, Cox’s Bazaar, Khagrachari, Rangamati, and Bandarban districts at risk of landslides, he said. Over 100 people have been killed by landslides in Bangladesh this year alone, say local media. Despite a government ban on the practice, indiscriminate hill-cutting by developers and locals - alongside deforestation and unchecked migration - is creating what Matin describes as a “man-made disaster”. “So why have these landslides suddenly started happening?” asked Matin, who also works at Krishi Bhavan, a government-run research centre meant to help the country’s rural population. “First, Bangladesh’s hills are alluvial hills - they’re made of sand and soil, and a little bit of stone. These are of a loose type. What holds the hills together are the large number of trees on these hills, and these trees are being cut down,” he said. “Second, hundreds of hills, even the ones that are public land owned by the government, are being cut down by influential people, and they are being cut unabated. The hills of the southeast could disappear in a few years at this rate. Cutting the hills destroys their integrity, making landslides more likely. 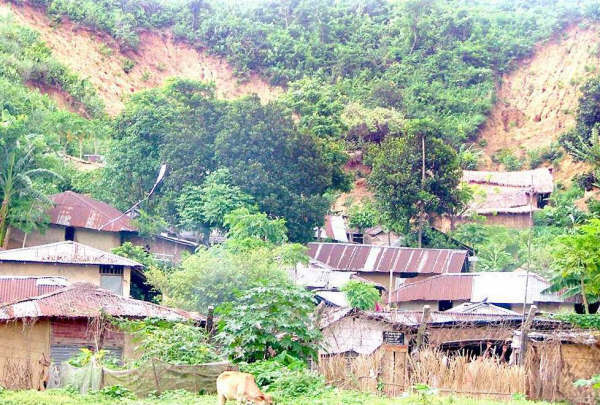 Hundreds of shanties, vulnerable to landslide, have grown on the slopes of hills in Chittagong city. Matin notes that the indigenous population of the area, who are mostly Buddhist and Christian minority ethnic groups, build different types of stilt-based homes that are less vulnerable to landslides and inflict less damage on the hills. Stemming the growing influx of ethnic Bengali migrants to the area, whose construction methods are invasive, and rehabilitating those buildings already constructed, will be critical in reducing the disaster threat posed by landslides, he said. “They build on slopes that shouldn’t be built on and cut away the hills to construct their homes,” said one local. Changing such behaviour will not be easy, say activists. Many of those who were earlier relocated from landslide-prone areas return to them because of the lack of opportunities elsewhere; they feel compelled to take the risk. Bullu Mia, a villager in Ukhia District in southeastern Bangladesh, is rebuilding his home on almost exactly the same spot where a landslide buried alive his wife and son in June. “Where else would I go,” he said. Bullu and his young daughter were sitting on a step on the front door of their tin-shack home when the earth swept down on them. He recalls being forced aside by what felt like a kick in the stomach, and passed out. His wife and son, who were inside the house, were crushed. According to a 23 October UN report entitled Reducing Vulnerability and Exposure to Disasters, high levels of vulnerability and exposure across the Asia-Pacific region are often the result of poorly conceived development planning and practices. “Poorly considered actions, and often official inaction, can result in settlements growing in hazard-prone areas,” the report said.